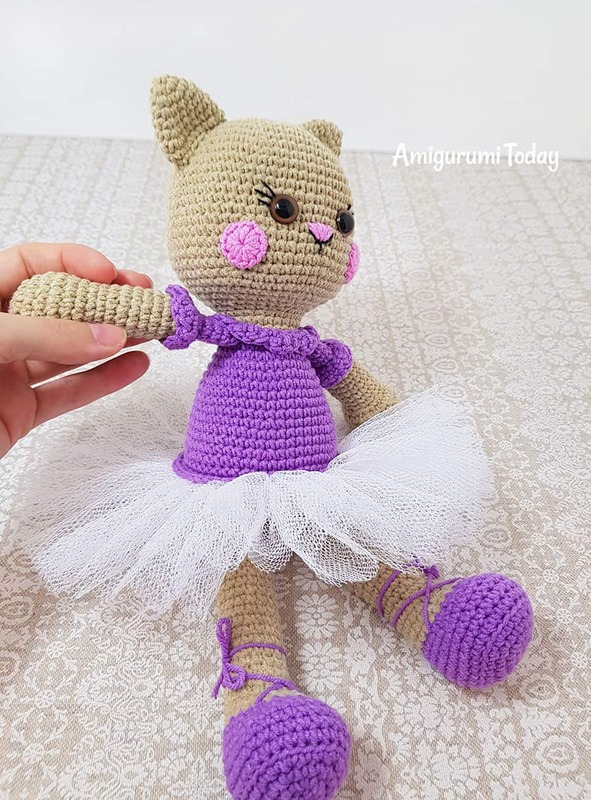 This Ballerina Cat Doll Crochet Pattern will help you to make a wonderful gift for a little girl. It’s not a secret that most of little girls love cats, dolls and dancing. 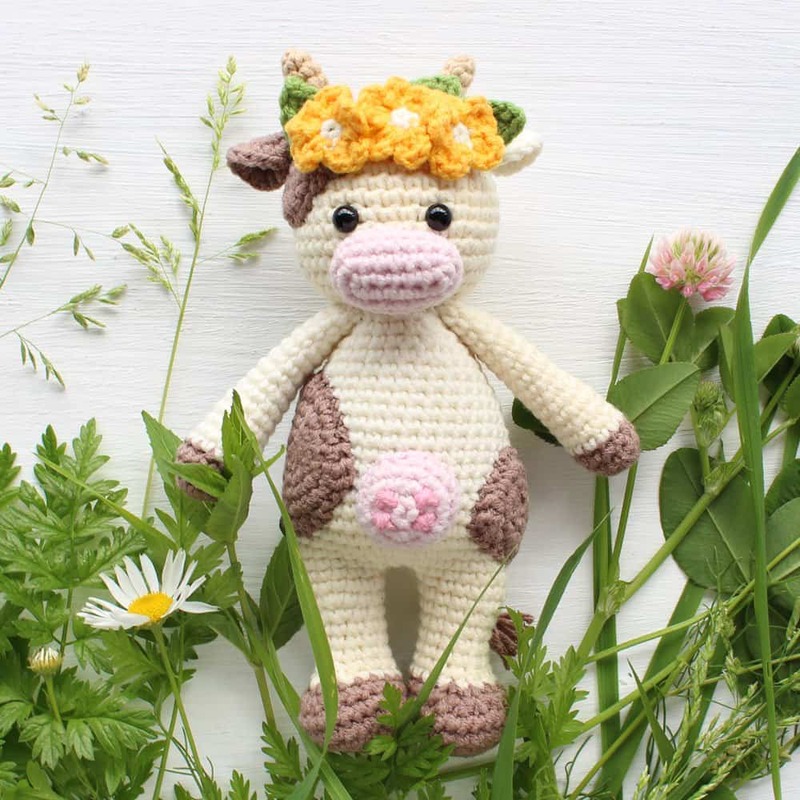 So, this crochet toy combines all of these things! Start crocheting the head with dark beige yarn. Stuff as you go. Insert safety eyes between Rnd 15 and Rnd 16 (about 7 st from each other). 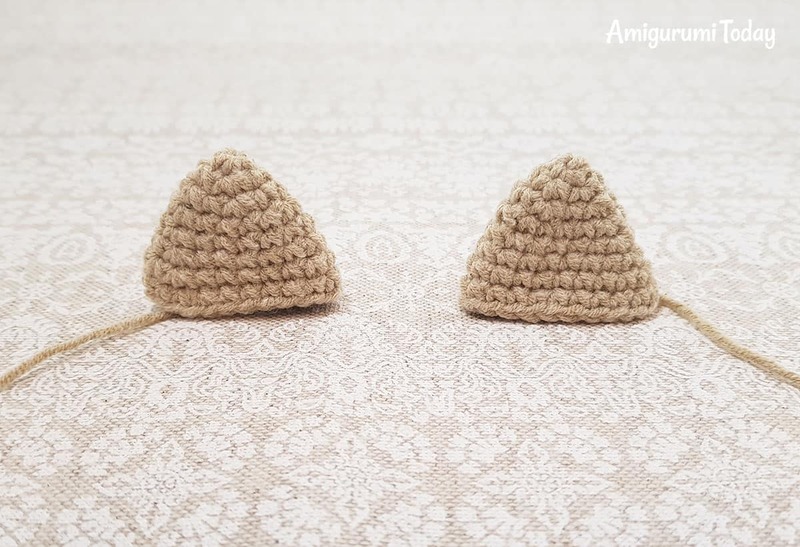 Crochet with dark beige yarn. 12 hdc in magic ring, join with sl st.
Start with dark beige yarn. Stuff only the bottom part of the arms. 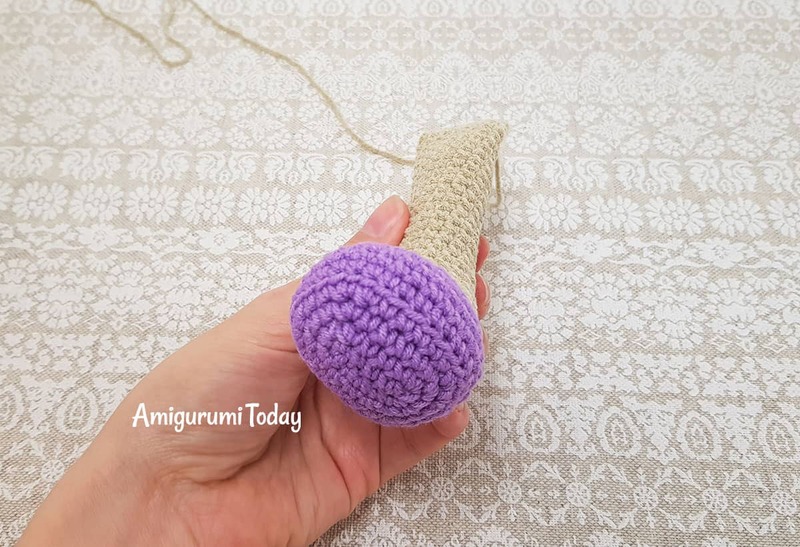 Rnd 19: crochet this round in back loops only, change color to lavender one and continue as follows: BLO sc in all 14 st.
Crochet sc in next 2 st, then flatten the the upper part of the arm and crochet sc in next 6 st through both layers. Fasten off leaving a tail for sewing. Change to dark beige yarn. Flatten the the upper part of the leg and crochet sc in next 7 st through both layers. Fasten off leaving a tail for sewing. Make a belt at the waist using front loops that left after Rnd 45 of the body. Join with sl st, fasten off and hide the end. Take some veiling fabric for the skirt and put it on your cat gathering at the waist to determine the size. Gather the skirt at the waist with the help of sewing needle as shown on the picture and sew it right underneath the belt. 1. Sew cheeks on the muzzle between Rnd 17 and Rnd 22 of the head (about 11 st from each other). 2. Make the ears slightly round-shaped and pin them on the top of the head between Rnd 3 and Rnd 11, then sew them on. 3. 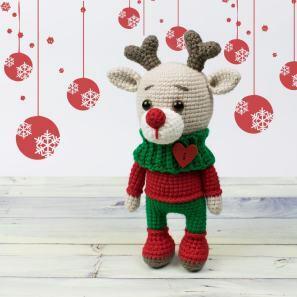 Embroider a nose and eyelashes. 4. Pin the collar around the neck and the cuffs around the sleeves, then sew them on. 5. Sew arms to the body right under the collar. 6. Sew legs to the bottom of the body like it’s shown in the picture below. 7. Insert two strands at the sides of the shoes and tie them like ballet shoes. 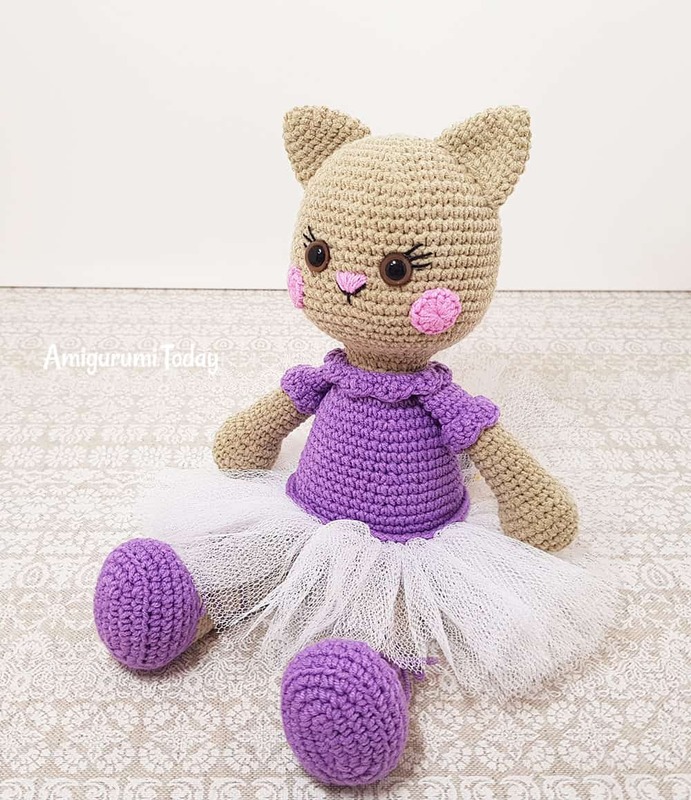 If you have any questions concerning this Ballerina Cat Doll Crochet Pattern, please write them in the post comments. Has anyone made the skirt. I have no idea of how long the skirt is. has anyone decided to crochet a skirt instead and if so how did you do it? Ginny, I used Caron Simply Soft and turned out nice! Can you please recommend a yarn to use. Can’t find the Yarnart Jeans. I would love to make the cat but I’m having a problem finding the yarn. Can you suggest another yarn to use. I am having a problem with Rnd. 9 of the foot. The numbers don’t quite come out right. Please advise. Also, for the eyes I crocheted amigurumi eyes using two of the 4 ply strands then sewed the eyes on. I omitted the cheeks and added a smiling kittie mouth. 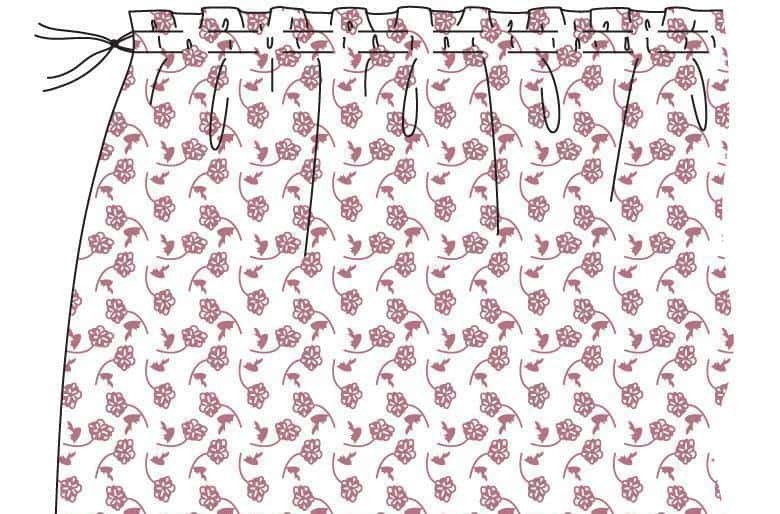 Love this kittie ballerina pattern. Hi Karen 🙂 Thanks for your feedback 🙂 The Rnd 9 of the foot is correct. 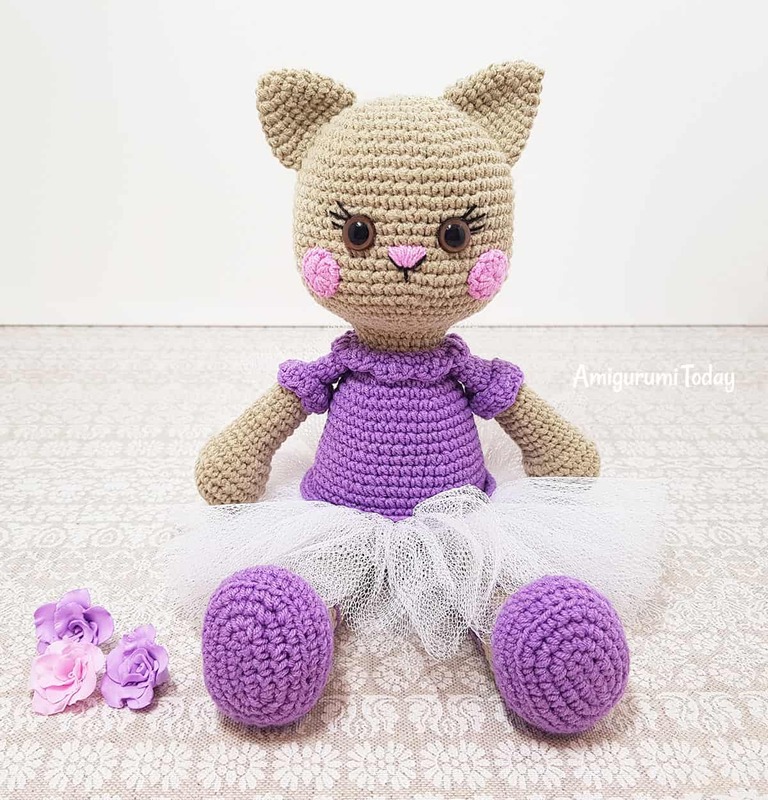 Okay so I’m trying to make this Sweet ballerina cat for my granddaughter for Easter , i’m on round 20 and I’m just Deff .not seeing the head in the pattern at all*( ..maybe i’m just being inpatient i don’t no but if someone could reassure me i will finish it out Thanks .. PLEASE HELP! Just finished my second cat. I love this pattern! I made this last one with hearts for the cheeks instead of circles, in honor or Valentines Day coming up. What size yarn do I use for these? I sent this question once before and never saw a reply and now my question is missing 🙁 I will look for your reply. Thank you! Are you going to bring back the Daisy Duck pattern? I was going to make it for my grand daughter, but you took it off of the website. Would you bring it back, please?! Thank you! Yes, it will be updated and will be published soon. 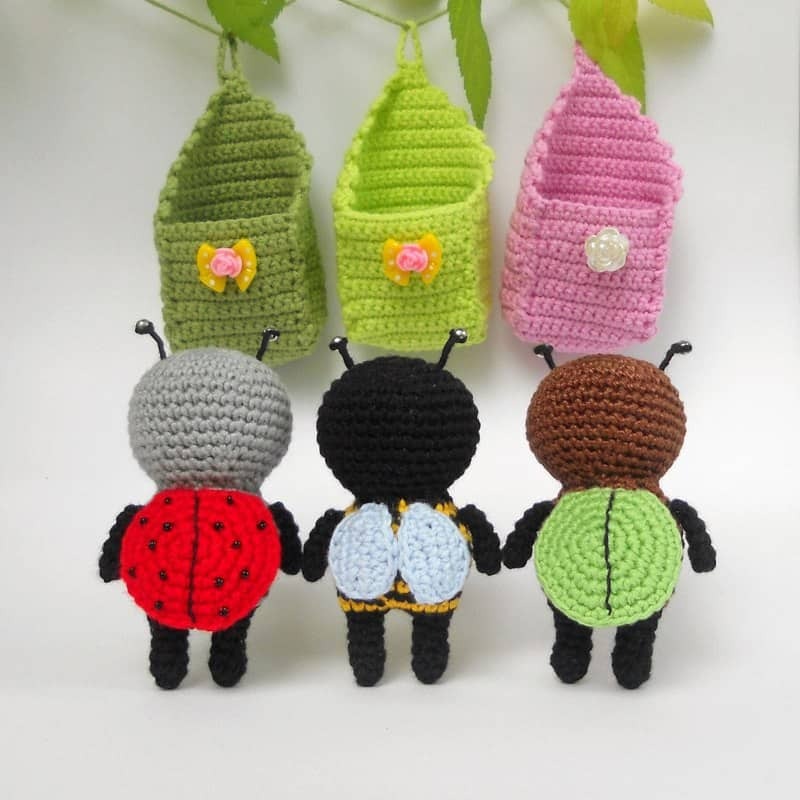 I’m I guess a little new at crochet, but I’m confused in what the difference is between, inc 3 times, and sc 3 times in st? I’m working on the feet and that keeps throwing me off. Thanks for any help and for the pattern! “inc 3 times” means that you should crochet 2 sc in each of the next 3 stitches. “sc in next 3 st” means that you should crochet 1 sc in each of the next 3 stitches. When do you do the surface stitch for the skirt? Also, how do you attach the skirt to the surface stitch? Hi. I made this adorable cat but in comparing to yours, the stuffing is very visible and there are larger gaps in the stitches. What do you advise? Smaller hook and different type of yarn? 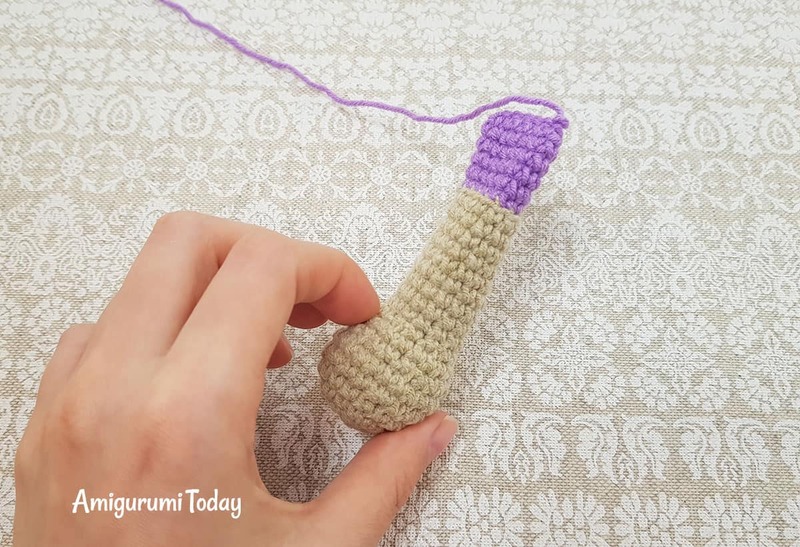 Hi Jan, you need a smaller hook for your yarn. Also, please control a crochet density, do not pull out big loops. I’m not getting how to “make a belt using surface stitches” (42 dc). Please could you clarify this a bit? Thanks for the tutorial! I’ve used surface stitches often, the reference to double crochets (42 dc) threw me a little! 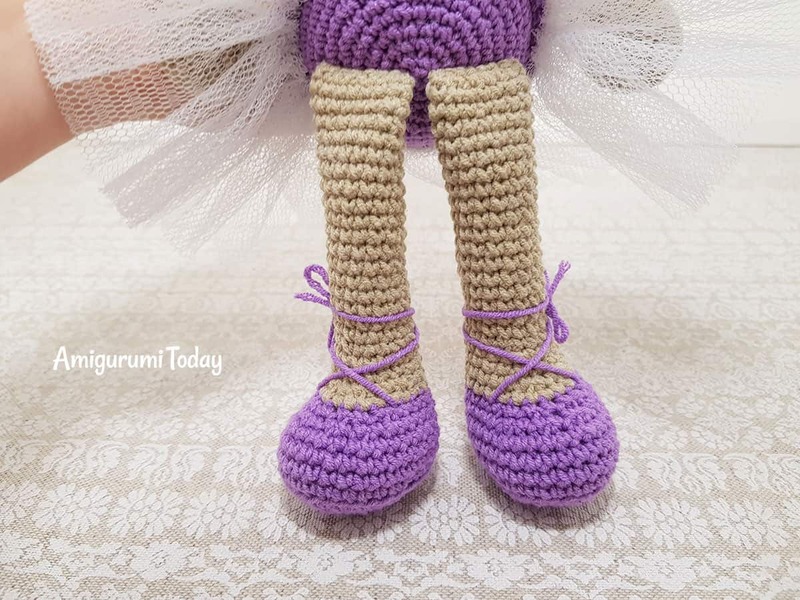 Can’t wait to start with this ballerina cat. It helps to read the comments before I start to prepare. 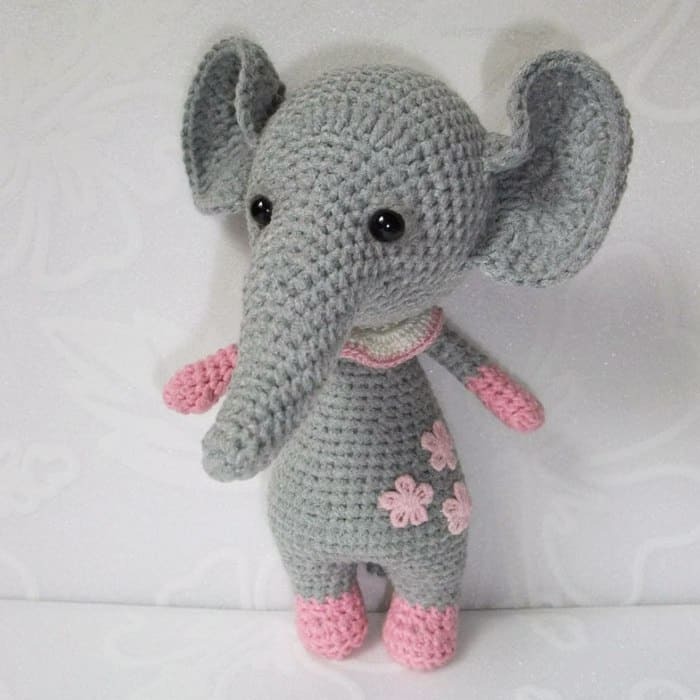 Have a question for you, I am looking for a chameleon pattern, do you have one? Thanks, love your work. Hi do u fold the arms and legs lengthwise and don’t stuff don’t see how I can stuff if it’s folded. Thank you my niece saw this and asked me to make it. I’m enjoying ur pattern. Hi Terri, please stuff the legs before finish them. Arms are stuffed only in the bottom. I just completed the head and curios as to wear the neck starts? The dress starts in pink and not grey? 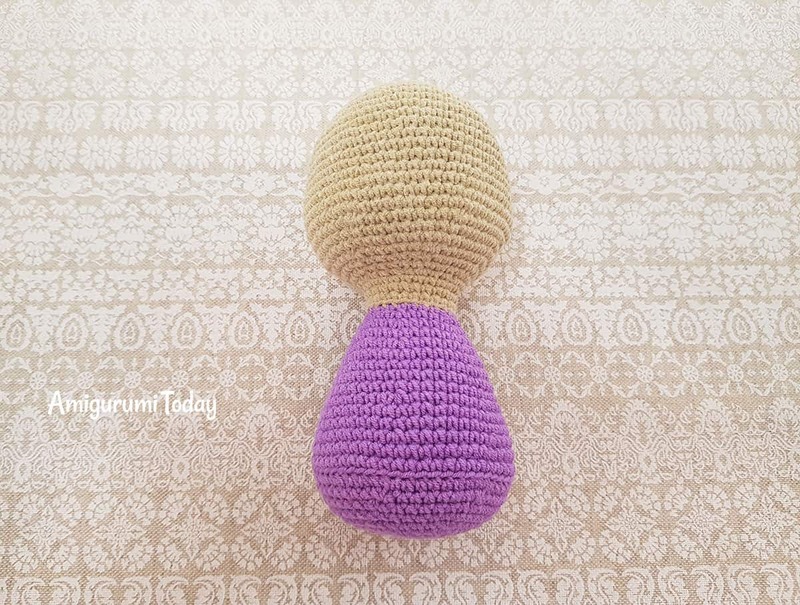 The neck starts when you crocheting the body at Rnd 26. The body is made from the bottom up. So, you begin with pink yarn and end up with grey one. çok çok teşekkürler. kızım için bir tane ördüm. harika oldu. Probably a dumb question but is there stuffing involved with the cat doll? Yes, note that the arms are stuffed a little. Please tell me how to make an oval starting from second chain from hook in legs. I must work on both sides of the chain? In round 1 from legs I don’t know how to increase. Thank you. Hi Ioana, please work on both sides of the chain. 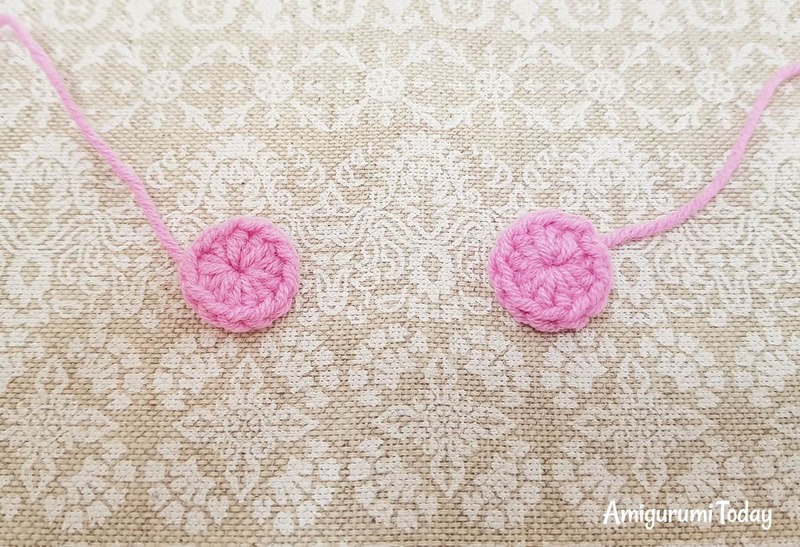 To increase stitches crochet one time 3 sc in the st and second time – 2 sc in the st (please follow the pattern instructions). Also curious how the skirt is made/attached! Good morning, how long will the finished project be? Hi Nyawira, about 30-35 cm, but it depends on hook size and yarn thickness. Hi, it means Back Loop Only. So, you should crochet only in back loops of the stitches. Hi Lolly, you need to crochet on both sides of chain (ch 6). 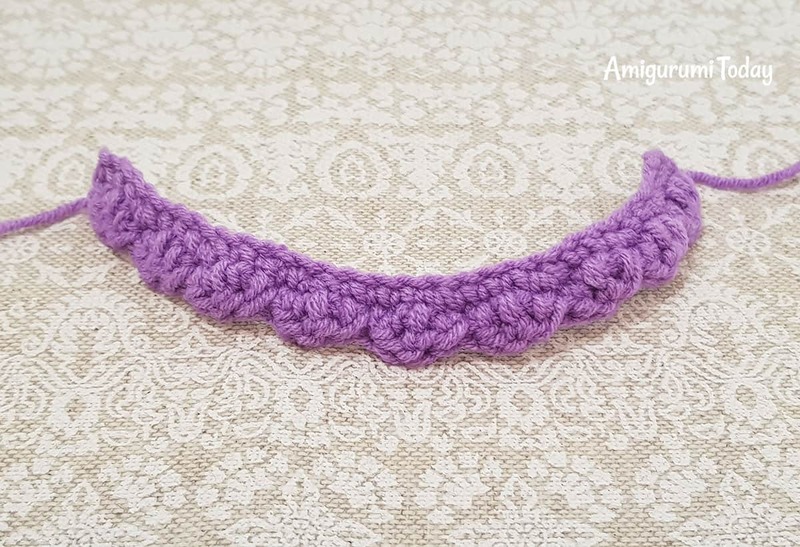 Make 4 sc starting from the second stitch from hook, 3 sc in next st, turn and then crochet on the opposite side of a chain: sc in next 3 st, inc . You’ll get a small oval. Continue crocheting in spiral according to Round 2 of the pattern and so on. Thank you, that’s what I want getting. Such a cute kitty! 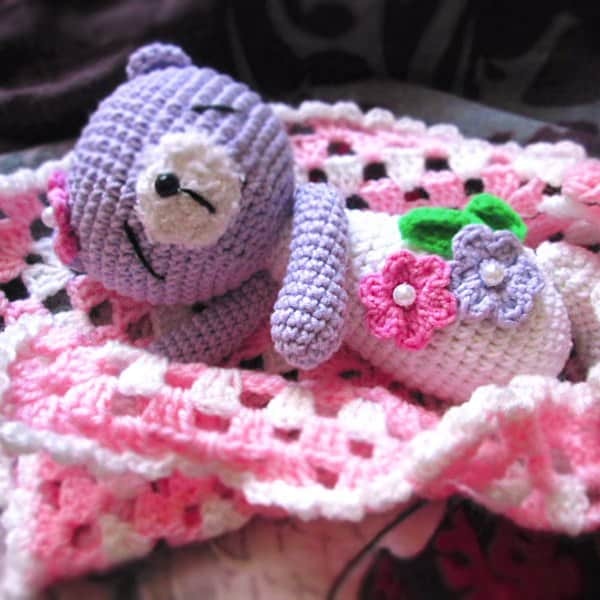 Making one for my niece right now!